FRESNO, Calif. (KFSN) -- A group of young Santa friends from the Fresno area has turned their excitement for Christmas into an effort to give back to those in need. Paul and Jacob Nevarez, Jake Hernandez and Josh Alvarado are between the ages of 18 and 21. 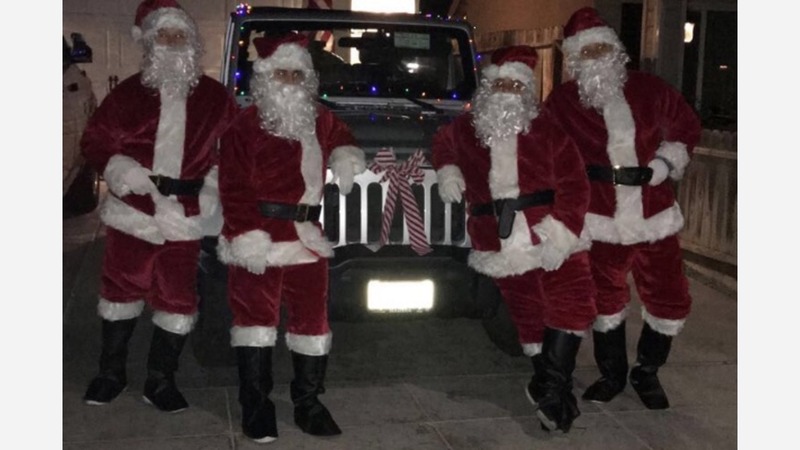 With their favorite holiday approaching, they came up with the idea of dressing up as Santa and driving around Fresno with the windows down, blasting Christmas music. Their goal was simply to make people smile. Smiles weren't enough. Now, they hand out candy canes, give toys to kids and blankets to the homeless on the streets. They say there are a lot of people out there who are less fortunate, so they're willing to do anything they can to help out. "It makes me and my wife very proud of them all to see what they are doing," said Paul Nevarez, father of Paul and Jacob. "I hope they continue spreading holiday spirit and if they can make a few people smile it makes it worthwhile." Now they're hoping to raise money to purchase more blankets, toys and small bags to fill with basic toiletry items. "We are looking for any little bit of help so we can continue to buy gifts for people to spread the joy and make people smile," they wrote on their GoFundMe page.